The sausage really enhances the egg flavor. Every Easter, we end up with a couple of dozen boiled eggs. Boiled eggs are great, but what else can you do? You can always make deviled eggs. 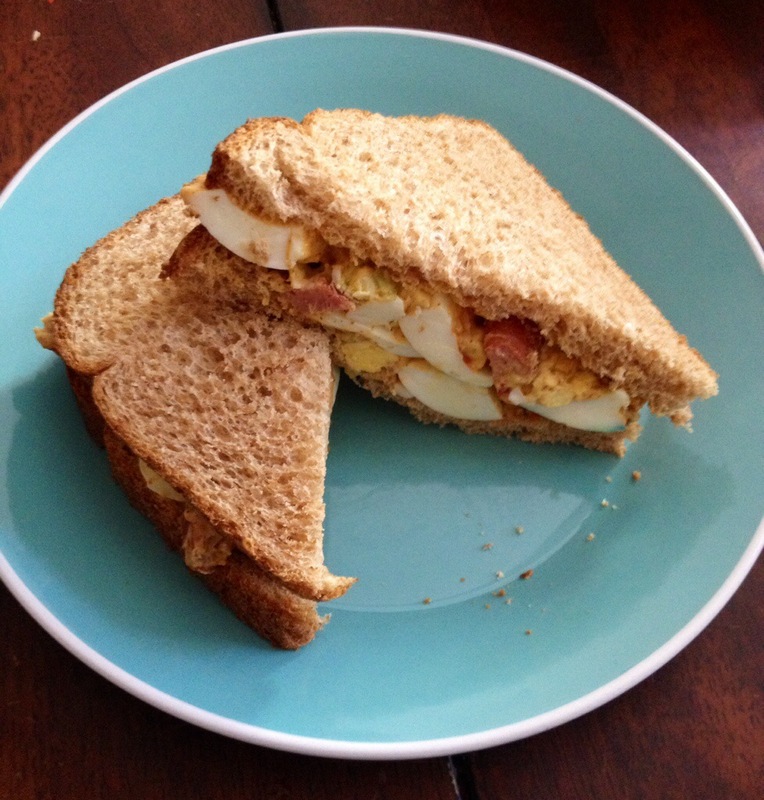 I wanted a simple sandwich today, so I made egg salad. I have never made egg salad before, but there’s nothing to it. Eggs, mayo, mustard, etc. I did not use any recipes for inspiration for this endeavor. Fortunately, I had the forethought to write it down. DO NOT skip the smoked sausage. The sausage really brings out the egg flavor. And the sausage flavor. Note: I have not received any promotional consideration for any of the above products. These are products I prefer. I certainly won’t shill a product I don’t believe in. Who can resist smoked sausage? Not me. Cut sausage link in half and throw in a skillet to heat up. While the sausage is sizzling, chop boiled eggs and place into a bowl. Mince peperoncini and add to the eggs. Dump in paprika, cajun seasoning, garlic powder, mayonnaise, and mustard. Once the sausage is good and sizzly, take one half of the sausage and half it again. Then, chop those two quarters and throw the pieces into the egg mixture. 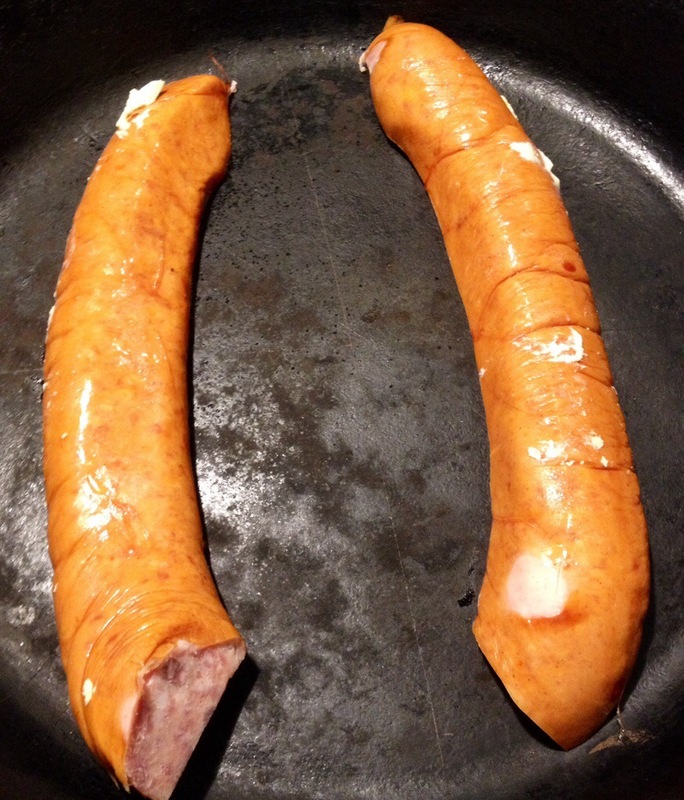 The other half sausage link makes a great snack while you are making egg salad. Or you can give it to the kids since they probably won’t be eating any egg salad. Mix the ingredients together and throw on some bread. Enjoy. I would really appreciate any feedback when you try this recipe. It’s a work in progress. I may cut back on the cajun seasoning because of the salt content, but my wife said it was perfect. I also think it may do well with a teaspoon of balsamic vinegar, but that is for another culinary adventure.